This whiskey-based product concept brought us on to help them raise $18,000 through crowdfunding, and come to market. Our campaign raised nearly $200,000. Building upon Time & Oak’s initial brand concept, we needed to expand their vision into product photography, packaging, social media platforms and video. Their identity needed to be cohesive across all current and future products, appeal to a wide array of consumers and be as timeless as whiskey itself. After Time & Oak’s massive success on Kickstarter, the move to retail was swift and necessary. We designed the packaging and shipping collateral for all Kickstarter orders as well as the new retail hang-packs. The packaging needed to effectively communicate how to use the product, the science behind why it works, and be as conservative on materials as possible – in preparation for mass production. Time & Oak goal’s for the Whiskey Elements brand was to appeal to both the experienced whiskey drinker and the spirits hobbyist. Since the science behind the product can come off as pretty complex, we needed to come up with a way to make the brand approachable, not overly scientific – yet still respectful of the deeply-rooted history and tradition behind distillation. We were tasked with helping finesse and expand the parent company’s existing identity into the more specific Whiskey Elements brand. Much of the design groundwork had already been laid out, so for us it was a matter of finalizing concepts and providing brand-specific usage guidelines for expansion into packaging and web/print content. Since the products were such a new concept, there was a lot of instruction and education involved in properly using Whiskey Elements. To solve any misconceptions about what the Elements did or how to use them, we designed the packaging to operate as an eye-catching infographic. The visual aesthetic was designed to appeal to the utilitarian tastes of their target demographic. Time & Oak needed a wide variety of product photography taken to account for Kickstarter, Amazon and their online store: all of which had individual image specifications. We photographed their entire product catalog for eCommerce, generated social media content through lifestyle shoots, and captured imagery of all their auxiliary products and accessories. 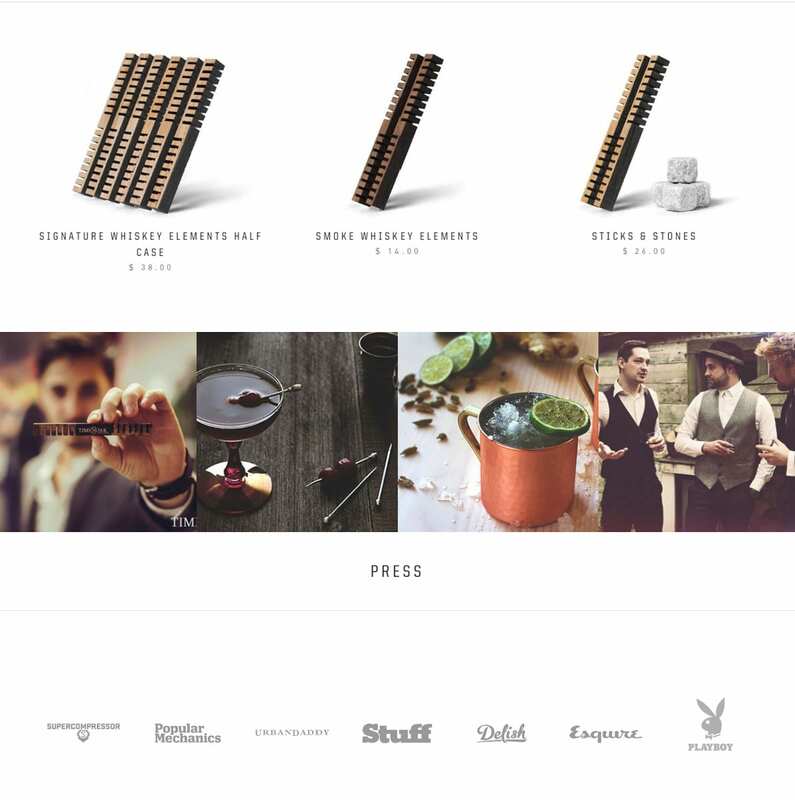 To avoid any loss in sales, the Whiskey Elements website needed to launch the same day the Kickstarter campaign ended. This can be a challenging transition for any company who gets their start through crowdfunding, as the website also required that all visual facets of the brand needed to also be completed. This including populated social media channels, brand identity, typography and product photography. We had just under 2 months from company start to this point – and thanks to the hard work, organization and communication between the client and our team: launched on time.